…send me a connection, I’m trying to boost my own self-esteem by getting to 500+ connections–even if I have no idea what LinkedIn is useful for) and I noticed that I have been endorsed more than twice as much for my skills and expertise in Statistics than I have been for my skills and expertise in Economics. I have reflecting for a while about the endorsements that I have received. Please don’t get my wrong – they are all probably very useful. But I’m an agricultural economist who wandered innocently into forestry (well I was offered a job that I hadn’t applied for – those were the days…) and I have been stuck here ever since. So please, can you try a bit harder? Let’s have some balance: I need endorsements, for my self-esteem, in agricultural economics, and then forest policy. 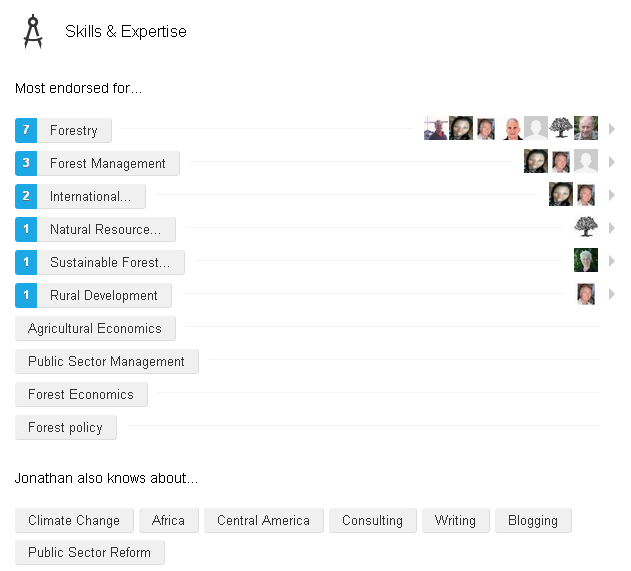 Also: I have also added a new category for LinkedIn: “A Good Bloke”. This is closely related to the beer test. No discrimination is implied — gender or wine — after all ‘some of my best friends are beer drinkers, etc.’. It seems noticeable to me that in David Beckham’s football obituaries he is described as “a genuinely nice bloke” and “a midfielder of considerable strengths, a taker of sublime free-kicks, a global brand, a nice guy, a genuine role model, a petulant peacock at times but always a tireless worker for his teams”. He is probably an interesting person to talk to and to have a drink with too. Recently I have been subsidising the Muthaiga Rendez-Vous bar. Join me, and decide whether to tick my Good Bloke endorsement.